“This Sonic 6 is in exceptionally good cosmetic condition and 100% FULL working order. I purchased this instrument around 15 years ago and have had it in safe dry storage since. When purchased it had been fully overhauled and I expect it to be in the same condition. I’ve powered it up and have tested it myself and will give you my findings. I’m selling as is, but believe it’s in very excellent condition inside and out and should be no major issues. The Moog powers up just fine and main light goes on. Oscillators are working, Filters and resonance check out fine, pink and white noise check out well as well as ring modulator functioning fine. The outputs seem to be in good shape however noticed that the l-r function seems to be noisy and may just be in need of some silicon spray. The unit operates on internal speakers as well as a monitor output, both checking out fine. Other than these functions, I’m unable to test further but, the moog sounds great. ” The Moog looks excellent but the Contour Shaper, the articulator.. envelope shaper has been “broken” for a few years. At its prime the Moog’s tone oscillators where crystal clear, able to use saw-tooth waves, sine waves square waves and combine them in any way imaginable. Ring modulation, control generators, triggers, white noise, pink noise and pitch scalers could produce anything from a Bach invention to microtonal avant-garde radical compositions. As you can see from the pictures there are a few knobs missing…but the sliders are intact. 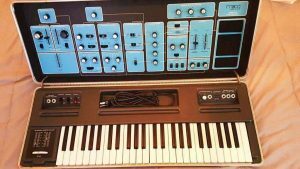 “Moog Sonic six up for grabs. Has all knobs, sliders, end caps, in tune. Recently serviced. 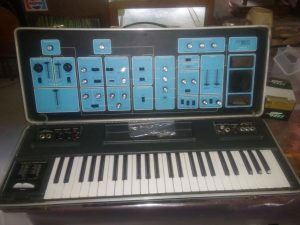 After 20 hours of work and an invoice of 1740 € ( that will be given) Mr Dierstein gave full life back to this rare Moog Sonic 6. And the case is also, apart minor scratches, in a very good condition both on top of the case and the bottom. “PHYSICAL CONDITION – Very Good: Some slight discoloration, leftover tape residue, minor scratches and blemishes, but it looks very good overall. There are a few non-original slider caps. – Most functions of the synthesizer work, but it needs servicing and calibration to the specifications in the included service manual. – The 4 octave keyboard has failed completely and does not work, it triggers the loudness contour (envelope generator), but does not track any pitch regardless of what key is pressed. recently serviced, including full calibration. Outside in very good condition. but note the following minor things. 2 slider caps missing. Ring Mod works, but pot occasionally intermittent. Keys a little sticky. There is one catch missing. 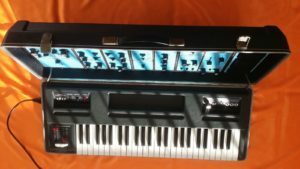 “I have owned this moog for over 20 yrs. As guitar is my primary instrument this moog has barely been used-well under 10 hours total!! It is in extremely clean condition as the photo’s show and comes from a NON-smoking environment. Every knob and slider works perfectly! Not even electronic cleaner is needed-no scratchy pots! Well taken care of. Mostly sat closed and on a shelf. This can create some really wild, unique and unusual sounds!! Listen to Pink Floyd and you can some idea of how the Moog can be used in general. Sci fi central for sure! I prefer to keep this because of the cool sounds it can make that I have yet to fully explore and the rare ANALOG version of sound manipulation.